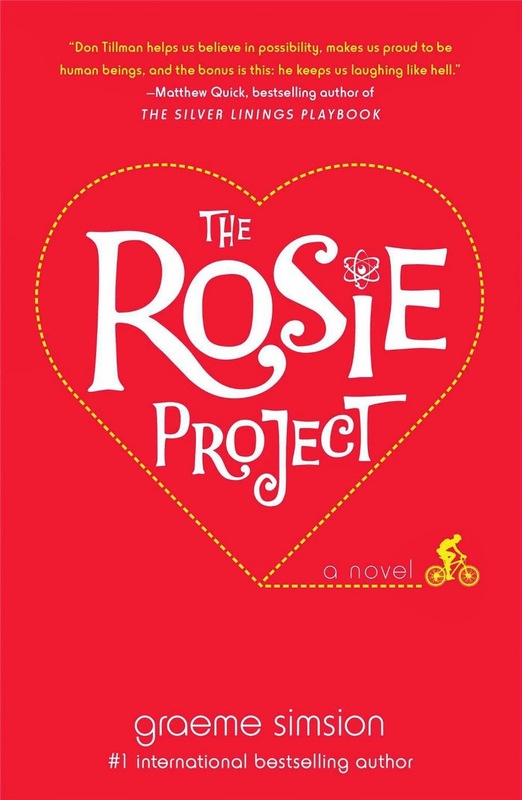 Graeme Simsion’s THE ROSIE PROJECT is a story of a man who is a little left of center. He’s a bit too precise, particular, and peculiar for the average female to appreciate; and on the whole, he doesn’t understand them or what it is he’s doing wrong to upset them, though he knows he must have done something. He’s never been good with women, but he’d really like to do something about that. He decides to create The Wife Project. Dr. Don Tillman is a very rational, scheduled, and disciplined man; he’s a genius in his field and he’s solved some of the most trying perplexities in his area of expertise. He can surely solve how to get a wife. So he treats the problem like he would any other scientific problem. He starts by gathering relevant data. He makes a questionnaire, only 16 pages long, to screen to the most likely “data”, not wishing to date a smoker, an alcoholic, or a perpetually late person. He doesn’t have time to waste; and he certainly wouldn’t want to waste anyone else’s time if he knows right away they’re not The One. Except even with this exceptional screening application, the dates that come from this don’t exactly go to plan. What’s even more hilarious is that although we know Don is picky to a fault, we have to agree with him on his dates that the women he goes out with are not The One. I mean, he’s not being picky if it’s clear they’re not meant for each other, right? And then he meets Rosie, whom he thinks was screened to be appropriate from his application, but come to find out early on in the date, she is the last person he could end up with. She smokes for one. She drinks like a fish. She swears incessantly. She waltzes around and changes up things in his apartment without getting his permission. She’s extremely stressful to his discipline and routine, never mind his schedule. Yet the time he spends with her is the best time he’s ever had in his entire life. Even better than the time he spent at the Museum of Natural History in New York. It’s unforeseen…and miraculous. Despite that they are absolutely wrong for each other, which he doesn’t hesitate to tell her, Don finds himself drawn into helping her. Though he can’t explain why he needs to help her. What he doesn’t want to admit to himself is how much he enjoys being with Rosie, even though she’s absolutely the wrong person. It soon becomes apparent, given how he’s willing to disrupt his routine, schedule, and discipline to “help” Rosie with her little problem, he will do most anything to spend more time with her. This book defies one classification. It’s a love story, yes; but it’s also a mystery and a laugh-out-loud comedy caper and a sweet, compassionate look at how when we set up walls for those we let into our lives, we’re not screening out people because we’re too picky or the persnickety ones, but that it’s our fear of being rejected and unloved for who we are and how we try to stack the odds in our favor. Yes, Don does seem on the surface quite a bit like a certain character on the Big Bang Theory; however, the more you know him, the more he reminds me of Ewan MacGregor’s character in Salmon Fishing in Yemen. The comedy of the first, but the sweetness and vulnerability and growth of the second. Aspies rule, as they say in the book. So how good was it really? It was so good I actually bought it as an e-book and read it (and I hate reading on my computer; I’d rather have a “real book”); and I read it in about 2 days, but if I had started earlier I would have gotten it done in one. It was so good, I was afraid my neighbors would come over and tell me to stop laughing so loud, especially at 3 a.m., because it was freaking annoying; and I was afraid if they did come over, I would start reading the funny parts to them and insist they buy the book. It’s adorable and hilarious; and at the last page, it ended just the right way and I was so genuinely satisfied, I could have gone back to the beginning and read it again. So eat that, Nicholas Sparks. This is a love story worthy of the name. Readers, tell us about the last book that made you laugh out loud. Love always finds a way .... in theory. .... right? I think I will read this one! Q, I had wondered about what you would think of Don's scientific methods. *LOL* I'm sorry they're so clearly flawed. *LOL* Nonetheless, as you say, love finds a way; and this really is a funny, endearing book. Definitely give it a go, if you can! Welcome aboard, Hellie! Wonderful review! I've been hearing great things about this book from a lot of people. I really need to move it up my tbr mountain. Please do. Terri convinced me to read it (I mean, this has all been word of mouth, right? *LOL*) and I'm so glad I did. Marnee, I hadn't heard of it either until Eloisa James brought it to our attention. Since then, I've noted several friends who have read it and I have yet to see a negative comment about it. Love the review, Hellie! Your reviews always leave me smiling. I too loved The Rosie Project. I read a library copy and then reread it when I bought a digital copy a few weeks ago. It was even better the second time. I'm working today on a review of Tessa Dare's January 28 release, Romancing the Duke. The humor in this one is Dare at her best, and the story tugs the heartstrings too. I cannot wait to read it again! *LOL* And I've already pre-ordered my copy of Romancing the Duke--so I cannot wait for this either!! :) Glad to know humor and heartstrings is evident in this one too...that should be a category: Humor and Heartstrings. Oh my goodness! A 16-page questionnaire! He really does sound like a perfectionist. I like Rosie. She sounds like a total hoot! The last book I read that kept me laughing out loud was "Better Off Without Him" by Dee Ernst. It was so funny and I really hated to see it end. Rosie is a hoot, but really Don steals the show quite a bit of the time. For someone who doesn't want to spend time with people who aren't "the one", he goes to incredible lengths to spend time with her. It's so adorable. The night they do bartending is hysterical. I'll have to look up Better Off Without Him--sounds like a good one! I wondered if I was going to get credit for this recommendation! This one was recommended by Eloisa James, so when the price dropped I grabbed it for my kindle. Could not stop reading. Marnee, I can't believe I didn't rave about this one to you, too. The last book that made me laugh out loud (before this one) would be a collection of stories by Leslie Langtry called My Heroes Have Always Been Hitmen. Ms. Langtry continues to share stories of the Bombay family of assassins and I'm greatly enjoying learning their history. You get full credit for the recommendation. :) See, we do like the same books, like one in a thousand...*LOL* Those aren't bad odds. *LOL* And you'd like more if you read the Harry Potter ones. Leslie is a scream--I can't wait to read the Bombays history as well. Great recommendation! I'm halfway through this book and can't wait to get back to it. I'm loving it. It will be interesting to see how he gets Don to deal with his emotions. Should be fun. Great review, Hellie. Thanks for the rec. I felt like a laugh a while ago and picked up SEP's LADY BE GOOD. That one always puts a smile on my face and has me laughing out loud in certain places. Lord, why are you wasting precious reading time on blogs? Dr. Tillman is calling!! I like how he learns to deal with his emotions too...or come to the realization he is in love. *sighs* He really is like that tender, sweet character from the salmon fishing movie...all the best stuff in one book. I'm reading Vanessa Kelly's Secrets for Seducing a Royal Bodyguard and it's made me both lol and cry which is my favorite type of read because that means it got to me emotionally. Catslady, I'm with you--the ones that can make you laugh AND cry are the ones that stay in our hearts the most. (Anne Gracie books do that for me many times.) I seriously laughed until it hurt reading this one, but I was still touched by how much Don made me like him, feel for him, root for him. I'd get teary eyed reading certain scenes and I'd want to yell at Rosie, "He's trying! Oh, poor Don." The Royal Bodyguard book--oh my! that is a GORGEOUS cover--I wanted to read it from the cover alone! Thanks for the great review! I have this on my list. Sounds really good! Yay! I hope you enjoy it!!! Kristan Higgins and Jill Shalvis always make me laugh. I just finished reading FALLING FOR HER FIANCE by Cindi Madsen and there were several LOL moments. It's a friends-to-lovers story and they were always making silly bets with each other. "when we set up walls for those we let into our lives, we’re not screening out people because we’re too picky or the persnickety ones, but that it’s our fear of being rejected and unloved for who we are and how we try to stack the odds in our favor." If that isn't one helluva FB status I don't know what is! A good book to take on vacation, but it's more than a quick read. It also teaches the reader about both the charm and suffering possible for anyone who processes and interacts a little differently than 'everyone else.' Charming, fun and well-written, you'll also fall in love with the protagonist before it is over.